The 2015 edition of the Business & Environment Awards stood out by a willingness to encourage society at large to be active in the fight against climate change. Thus, projects which tackled the fight against climate change were also rewarded, echoing the Climate Conference to be held in late 2015 in Paris (COP21). For each of the 5 categories of the Award, there was a special distinction for ‘Fight against climate change’ and a Grand Prize for the best project entered. Enterprise & Environment judges awarded prizes to 13 companies at an event organized by the Ministry of Ecology, Sustainable Development and Energy and the ADEME. The results were announced at the World Efficiency Trade Fair on October 13th, 2015. 130 candidates participated in the 2015 edition. The Business & Environment Awards were celebrating their 28th edition, confirming the growing interest shown by companies to preserve the environment, and more broadly for innovation in sustainable development. Every year, these prizes reward companies whose projects contribute to the reduction in resource consumption, the preservation of the environment and innovation in the eco-industrial sector. These awards have been extended on a European level, seen in the ‘European Business Awards for Environment’, organized every two years by the European Commission. In the category of ‘Management and initiatives for sustainable development’, the grand prize was awarded to the Palm Hotel & Spa and the ILOHA Seaview Hotel for having created an efficient environmental management system which aims to protect the environment in Reunion Island. This ambitious initiative, further bolstered by the European Ecolabel for tourist accommodation services, has made these two institutions a reference for the development of eco-responsible tourism. This category is a fine indicator for businesses moving towards sustainable growth. Today we are witnessing the development of new environmental management systems aimed at improving transparency and corporate governance as well as their performance in reducing the impact on the environment, a real challenge for companies who wish to remain competitive. Management is the backbone of any business organization which seeks to move into sustainability and implement lasting impact across the board. Reunion Island boasts stunning natural assets which are both exceptional but also fragile, and when the ILOHA Seaview Hotel opened in 1996, it was essential for us to find the most rational and responsible way to integrate our establishment within the surrounding environment, thus actively participating in the preservation of the island’s remarkable natural resources. This approach has matured year after year, and has now been formally recognised: the ILOHA Seaview Hotel has been awarded the European Eco-label, a voluntary certification valid in all member countries of the European Union. Established in 1992, it is the only official ecological label recognised throughout the EU, and is issued in France by the AFNOR Certification Group. – to inform and involve our staff and guests in this process on a daily basis. This process concerns all those involved in the everyday life at the ILOHA Seaview Hotel, including management, staff, suppliers and of course our guests. Everyone is involved, and we each play a role in contributing to the preservation of our environment. – using low voltage bulbs. – the hotel’s central building and the Cas’Akéa is heated by solar power. – bioclimatic architecture, reducing our everyday energy impact. – only using eco-labelled cleaning products to reduce our waste water pollution content. – changing linen every three days and towels only when requested by guests. – monthly monitoring of our energy and water consumption. – recycling bins in all bedrooms and throughout the hotel, (recycling points for glass, batteries, medicine and compost). – collection of used fats and oils. – limiting our waste production by preferring refillable packaging over individual packaging. – 100% electric vehicles used for internal transport around the hotel. – preferring local food products, thus promoting short journeys and highlighting the expertise of our local producers. – organic-certified products available both at the Cas’Akéa wellness spa and the Kotémer restaurant. – highlighting local handicraft and activities, for example using vetiver for our straw huts. To reach excellence, it is necessary to encourage as many professionals to participate as possible, using proximity as an approach to satisfy every tourist’s needs. In line with the national label for tourism quality, Reunion’s Quality Tourism charter is a unifying label which guarantees tourists with a holiday that will meet their needs. The service provider agrees to respect a series of selected criteria, ranging from the quality of the welcome to the services rendered, according to the establishment’s specific sector. Regular assessments ensure compliance with these commitments for the continued adhesion to the charter. 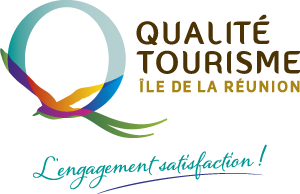 In order to provide customers with better hospitality and improve the quality of tourist services in France, the government set up the Qualité Tourisme ™ brand. It is a sign of recognition of establishments providing quality services that tourists can truly rely on. What are the commitments made by French tourism professionals? Quality in all domains: hospitality, service, professionalism and development of local resources are among the brand’s fundamental values. Professionals who display the Qualité Tourisme™ label are committed to providing the following: a personalized welcome, clear and precise information, competent and attentive staff, comfortable and spotless premises, and tailor-made local tourist information. What are the guarantees provided by the Qualité Tourisme™ brand? To obtain the Qualité Tourisme™ label, the service provider must successfully complete a quality checklist which corresponds to the national quality commitments, covering the essential requirements for client satisfaction. Recognized Qualité Tourisme™ professionals remain up-to-date thanks to the systematic analysis of satisfaction surveys and complaints. Their performances are regularly subject to unannounced and independent monitoring. These procedures allow professionals to continuously improve their services to better satisfy their tourists. This title is possible thanks to the combined will of the government and professionals who are able to identify and promote restaurateurs who have recognized professional skills and a commitment to use raw and fresh ingredients, while respecting health and safety regulations. The title is awarded by the government through the local Préfet, following audits carried out by an independent body. The goal is not to devalue various forms of catering, but to allow the consumer to identify the real professionals and to ensure all hygiene regulations are respected. The title of Maître Restaurateur is the only official title in the catering business. Even though catering is included in the label for tourism, this title is the only one officially recognized by the state. The title is now part of French law, giving it added significance. The title is issued by the government and audited by an independent professional body called Cuisine faîte Maison. The national label of Tables d’Hôtes & Inns in France aims to develop and promote the expertise of independent professionals working in traditional restaurants or hotels, and this both in France and abroad. – Support for staff training. In order to ensure this, unannounced visits by representatives appointed by the Federation take place, guaranteeing compliance with the existing national label and the brand image of ‘Tables d’Hôtes & Inns’ with regards to the public authorities and consumers. This is a French Association for the transmission, culture and modernity of culinary techniques. Created in 1954 by Jean Ducroux, the Association des Disciples d’Auguste Escoffier has 35,000 members worldwide in 30 countries, including 2,000 in France. – The research and implementation of actions for a charitable cause.